It wouldn't be the holidays without a thousand different versions of The Nutcracker, but this year Disney hopes to create a new Christmas classic with their lavish adaptation The Nutcracker and the Four Realms. The film is a rarity in that it is directed by both Lasse Hallstrom and Joe Johnston, the latter coming aboard to take over reshoots and post-production. Under normal circumstances, recognizing two directors who aren't a team just doesn't happen, but Hallstrom has been remarkably open to the idea, and we haven't heard a single word about there being conflicts during production. Quite the contrary, actually. Starring Mackenzie Foy as a young princess swept away into the Land of Flowers, Land of Sweets, and Land of Snowflakes, she must enter the dangerous fourth realm to defeat the evil Mother Ginger (Helen Mirren) and her army of mice if she ever wants to get home. 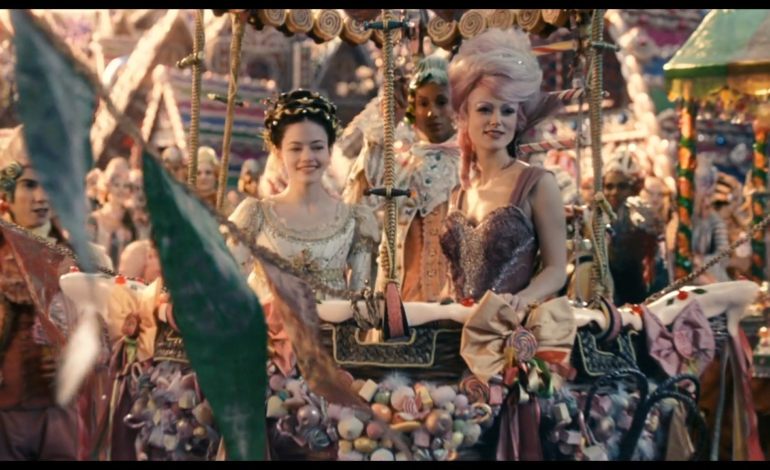 The film co-stars Morgan Freeman, Misty Copeland, Jack Whitehall, and Keira Knightley as the Sugar Plum Fairy. The Nutcracker and the Four Realms opens November 2nd.